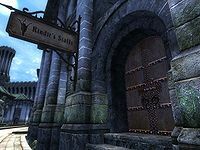 Rindir's Staffs is a store specializing in staves located in the Imperial City's Market District. It is found across the street from The Best Defense and next to The Copious Coinpurse and Edgar's Discount Spells. The proprietor, Rindir, has 600 gold and a Mercantile skill of 30. When bartering, he will buy armor, clothing, weapons and magical items from you while only selling staves and a few robes and hoods. His wares include the zero-weight Mage's Hoods which are useful for cursed enchantments and the unique staff Apotheosis, which has Fire, Frost and Shock Damage enchantments. He also sells two guaranteed magic items: a Staff of Light and a Staff of Telekinesis. 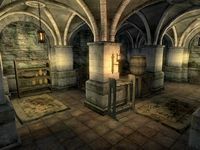 Rindir's Staffs is divided into three areas: Rindir's Staffs, Rindir's Private Quarters and Rindir's Basement. The main trading room is on the ground floor, and consists of a large counter, a series of display cases and a display of robes, books and staves. The room is spacious, yet simply arranged, with carpets decorating the floor and walls. The three windows in the southern wall are all uncovered, covering the area in a bluish tint, while the southern part of the room is more dark and lit up only by a few candles. The front door reveals the large counter to the left and a barrel with food and a sack with clutter to the right. 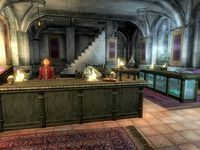 On the counter sits a tightly locked display case, unlocked only by the shop key, which displays a set of red silk robes with a matching hood and a set of white mage's robes. On the other end of the counter, a complete set of novice-level alchemy apparatus and a copy of Manual of Spellcraft. Three additional copies can be found on the curved counter nearby, as well as a lectern with writing materials and a shopping list. In the northwestern corner, Rindir has set up a small dining arrangement for waiting customers, a few chairs and a table with a bottle of cheap wine and two apples in a bowl. The locked display case nearby holds copies of two rare books, the tragic tale The Third Door and the early ayleid documentation The Wild Elves. Opposite the case is a big counter with a selection of Rindir's wares on display. On top lies a Mage's robe along with the matching, zero-weight hood. Also on display are a green robe hood and the ultra rare tattered robe. On shelves underneath the counter, visible behind inaccessible glass, sits a set of aqua silk robes and three lesser staves of telekinesis. The similar, but much smaller counter under the window, displays an inaccessible Staff of Light. Behind the counter is a locked chest with clutter and a chance of some assorted silverware, pelts and/or gold, and to the left is a small table with a novice retort. To the right is a barrel filled with food. Next to the barrel is a locked display case with a copy of the rare book Glories and Laments as well as two petty-leveled grand soul gems. In the corner opposite the basement door is a barrel and a sack, both with clutter. 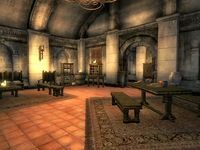 Rindir lives upstairs as is usual with Imperial City houses and stores. His private quarters consist of an antechamber that serves as dining room and a second room with a working desk, chests and a bed. The door opens to a small arrangement with a small table surrounded by six chairs. In the opposite corner, three wine racks holds Rindir's wine collection: nine bottles of Surilie Brothers Vintage 415 and twelve bottles of cheap wine. Between the racks, a barrel and a sack, both with clutter. In the opposite corner, a well-provided dinner table holds a wide array of food: two apples, two carrots, two radishes and one bread loaf, one tomato and one ear of corn. The cupboard in the nearby corner holds food as well. In the alcove are three crates, two barrels and a locked chest, all with clutter, even though the barrel on top of the crate has a chance of a torch and/or repair hammer. Halfway down the stairs is a chest and a crate with clutter and a barrel with food. In the main basement area are several empty weapon racks and shelves with clutter. The two crates between the pillars contain clutter while the barrel has a chance of a repair hammer. In the northeastern corner, a barrel with more clutter and a sack with a chance of a few lockpicks. The chest here is locked with a very hard lock and holds up to three pieces of equipment. In the northwestern corner, a knocked-over barrel with clutter and a chance of a repair hammer. The other barrel here and the sack hold only clutter. A lot of mages swear by Rindir's Staffs. Have you ever shopped at Rindir's? Have you ever bought a magic staff at Rindir's? Rindir always keeps a fine selection on hand. It's almost as if he knows my skill level perfectly.